If you’ve struggled to lose each pound while the men you know seem to drop weight without even trying, it’s not all in your head. Men do actually tend to lose fat more easily than women — especially belly fat in the midsection, notes the University of North Carolina. That doesn’t mean losing weight is impossible, though, or that you need a fundamentally different approach to weight loss than a man — it just might take a little longer to reach your goals. But aggressive diet and lifestyle changes will help you drop fat as quickly as possible, so you can get the body you want. The key to losing weight is eating fewer calories than you consume via food and drinks. That creates an Energy Deficit, so your body taps into other sources of fuel — namely, your fat tissue — to make up the difference. You’ll be able to lose weight safely creating an energy deficit of up to 1,000 calories a day, which will allow you to lose up to 2 pounds per week. Use a calorie-needs calculator to figure out your daily calorie needs; then subtract calories to create your energy deficit. For example, a 27-year-old woman who is 5 feet, 4 inches tall, weighs 160 pounds, and gets about an hour of activity a day needs roughly 2,500 calories a day to maintain her weight. She could drop her calorie intake to about 2,000 calories daily and lose one pound a week, or drop her calorie intake to 1,500 calories a day to lose two pounds each week. While you may be tempted to eat as few calories as possible to lose weight more quickly, don’t cut more than 1,000 calories per day, or eat fewer than 1,200 calories daily — even if that means your energy deficit is smaller than 1,000 calories. Eat too little, and you’ll slow down your metabolism and put yourself on track to regain the weight — often with a few extra pounds. While you’ll need a balanced diet that includes unprocessed foods like whole grains, fruits, veggies and healthy fats to lose weight, you should focus on protein to get the best results. Many women fall short in their protein intake, according to Precision Nutrition, but getting enough protein can actually help you shed pounds. Protein takes more energy to digest than carbs or fats, so including more of it in your diet actually boosts your metabolism. And protein also provides nutritional support for your workouts, so you can build sleek, lean muscle tissue to get a toned appearance. Support your weight loss and exercise program by getting about 80 grams of protein per 100 pounds of body weight, for example, 88 grams of protein if you weigh 110 pounds, or 104 grams of protein if you weigh 130 pounds. Alternatively, you can “eyeball” your portions by including a palm-size serving of a protein-dense food at each meal, such as salmon, tuna, turkey, chicken, lean beef or eggs. Other protein-containing foods to enjoy include nonfat dairy, nuts, seeds, lentils and beans. If you have a medical condition or desire a personalized eating plan, consult a registered dietitian for help. If you want to lose weight fast, you’ll need to get moving. Cardiovascular exercise helps you torch more calories; a 125-pound person, for example, burns about 600 calories in an hour-long high-impact step class, so you can lose more weight. Experiment to find a few forms of aerobic exercise you like — whether that’s a jogging session on the treadmill, a trendy cycling class or a ballet-inspired dance workout — to prevent boredom as you burn calories. And while the weight room can be intimidating for women, pumping iron is key to getting a toned and fit physique. 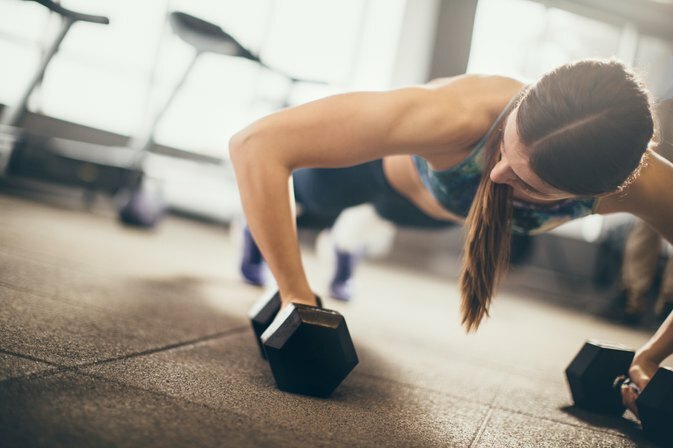 Don’t worry, lifting even heavy weights won’t make you “bulky,” but it will improve your posture, make your arms, core and lower body more shapely and boost your metabolism by building muscle. Schedule two or three workouts each week, choosing exercise to challenge your whole body each time. If you’re not sure how to start, consult a trainer at your gym. A professional can help you find your way around the weight room and choose challenging weights that will give you the best results. Unfortunately, even fast weight loss methods won’t change your body overnight; at a weight loss of 1 to 2 pounds weekly, you’ll likely be working toward your weight loss goal for weeks, months or even years. That doesn’t mean you can’t make a few tweaks to notice results more quickly, though. Pay particular attention to your posture throughout the day; simply standing and sitting up straight makes you look thinner and more confident. You can also play up your weight loss results through your styling choices. Use a belt to draw attention to your increasingly-defined waist, and play up your best assets with bright colors; for example, show off toned gams with candy-colored denim or a printed skirt. Minimize any “trouble zones” with darker colors; for example, a darker top can visually slim your waist and upper body, while dark pants or a skirt can streamline generously proportioned hips. The post How a Woman Can Lose Weight Fast appeared first on Honest Venus Factor Review.